Supported Operating Systems: Microsoft® XP, (SP2) Vista, or Windows 7. 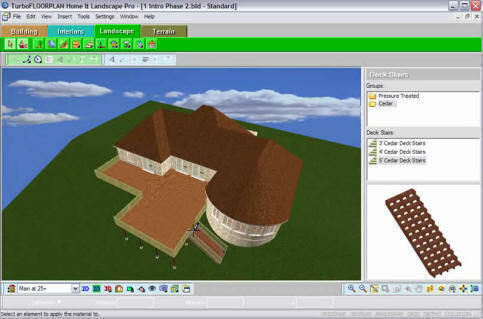 While this software is designed for people with no previous design experience, like the hobbyist or serious weekend builder, it has all the features you'll ever need for complete indoor and outdoor space design: landscaping, decks, sheds, terrain, pathways, fences, gates, and arbors. This software was fun to use. We really liked how easy it was to draw a deck by hand in any shape we liked. Although, like all the software reviewed on this site, we recommend reading through the deck section in the online help. Better yet, print it out and have it beside you as you practice. We liked being able to draw a deck with curves. It was also easy to add sliding doors and windows. Once your deck is drawn, you can click and drag to enlarge or shrink it, lengthen or shorten sides, etc. However, to change the shape by adding a notch, angled corner, or wraparound, we found it easier just to redraw the deck again in the new shape (just takes a few seconds). If you're deck falls into one of several basic shapes, use the Deck Wizard instead to design your deck (see below). One of the highlights of this deck design software is a deck building wizard that steps you through the deck design process. 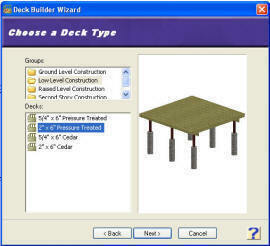 To begin a deck project in the Deck Building Wizard, you choose a deck type, general deck shape, deck rotation, and the decking direction. Once the basics are established, you can further add angels, curves, elevations, terrain, railings, stairs, and other deck enhancements. You can also specify deck color and materials. 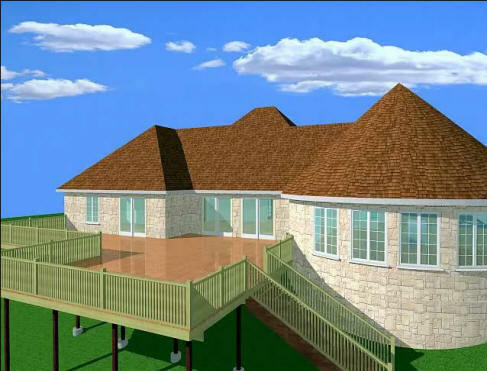 Seeing your deck in photorealistic 3D is also handy. You can view your creation from all angles in 3D,create a builder’s schematic of your design, measurements, and print a materials list and cut list. 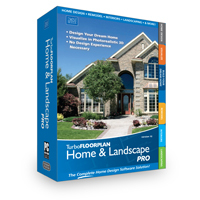 TurboFLOORPLAN Home & Landscape Pro also has a library of over 7500 plants flowers, shrubs and trees to create the perfect landscape, terrain and garden. Use your mouse to drag and then shape flowerbeds, and landscaping. Visit IMSI/Design for a wide selection of award-winning precision design, graphics and utilities software at great prices!